Wabash hosts a handful of art exhibits each year, and often those artists will spend a day or two in the department with faculty and students. For the past week, New York artist Elizabeth Huey has been in residence lecturing, meeting with students, and working on a sculpture which will be the center piece of an exhibit which opened Monday. "It’s been great having Elizabeth Huey here to meet with students," Assistant Professor of Art Elizabeth Lee said. "She has talked with a number of art majors one-on-one about their work. A couple of them then came to me asking for articles she suggested they might read." The experience is a new one for the artist. Though she has given a few lectures, this is her first time spending an entire week on a college campus as a visiting artist. "I definitely offered advice," Huey said of her time with students. "I enjoy contributing my perception of someone’s work. I enjoy asking questions and learning what artists are thinking about." Having an artist in the classroom, especially a young cutting-edge artist, gives the students a unique perspective. "It is refreshing for artists, even as undergraduates, to get a new perspective," Lee said. "Huey has an especially rich repertoire of images to draw from in her discussion with students. 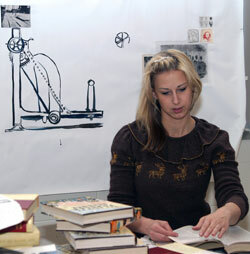 She has also been talking to students about the realities of life in the art world today." Huey said living in New York and being active in the city’s galleries provides her insight to offer others. "I’m so close to what many believe to be the center of the art world, Chelsea," she said. "I have that advantage of frequenting art openings and galleries. It’s hard to get coffee and walk my dog without running into an artist I may know from reading the newspaper or from having previous familiarity with. "If I’m able to see the beginnings of a (student) artist’s work then perhaps draw a relationship between them and an artist who may be more established or developed, students can Google their names and see images, see what galleries they show with, their statements, and potentially meet with them some day. I think that’s a big part of developing as an artist, forming these relationships with other artists." Huey earned a BA in Psychology from George Washington University then studied art at Marchutz School for Art in Aix-en-Provence, France, and earned her Masters of Fine Arts from Yale in 2002. "As a recent MFA graduate, she has a good sense of the art scene in New York and has been able to give students valuable advice on graduate school choices, career moves and such," Lee said. Another piece of advice Huey believes is important is using the internet. "If you look back in our history, art develops within groups," Huey said. "We have the advantage now of being in groups where one person is in California, one is in Kansas and another is in Brooklyn, "These groups don’t always have to be isolated to daily meetings in bars, and they can expand beyond that. I see myself as a person who could hopefully help to build - maybe even spark interest between artists." Huey works in large paintings. Her paintings are so large that they proved too heavy, and expensive to ship, that she will only have smaller pieces in the Wabash exhibit. But she is creating her first-ever sculpture as the show’s centerpiece. 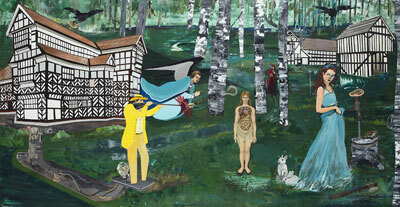 It will also include some large-scale collages and smaller drawings. Ken Johnson of the New York Times describes Huey’s work as "abrasively raw painting (that) envisions the mystical." Time Out New York wrote about her work: "Mixed-media painting whose romantic imagery suggests a spread in Vogue as imagined by Kai Althoff. Giant insects cavort with glamorous babes; dapper hunters mingle with floating angels in landscapes full of towers, swamps and gestural patterns." Her next major show will be in Sept. 2006 partly inspired by a summer visit to Crawfordsville. She visited in August to get a feel for the area before her November residency. She was fascinated by the Old Jail Museum. "I went online and started searching for images from Indiana and started looking at Crawfordsville," she said. "I happened to find this Old Jail online and started reading about it. I went for visit and had a tour. They cranked the jail for us. And then I happened to come across the medical history museum (in Indianapolis). "These two places intrigued me before my visit. I have since started looking at many hospitals, institutions, and prisons in Indiana and other parts of the Midwest." The artist will be on hand for the opening from 8 to 9:30 p.m. Monday, Nov. 14 in the Eric Dean Gallery of the Fine Arts Center at Wabash College. The event is free and open to the public and refreshments will be served. The hours for the Eric Dean Gallery are Monday through Friday from 8-5 p.m. and Saturday from 10-2 p.m. Admission is free. Hewitt is Wabash College Director of New Media/Web Editor. Top right: Huey visits during the art exhibit opening Monday night. At lower right: Huey worked on collages that became a part of the exhibit. In lower photo she is removing pictures from some old science books which will become part of the collage. On homepage: Students, faculty visit the "Old Jail" exhibit created by Huey during her stay at Wabash.